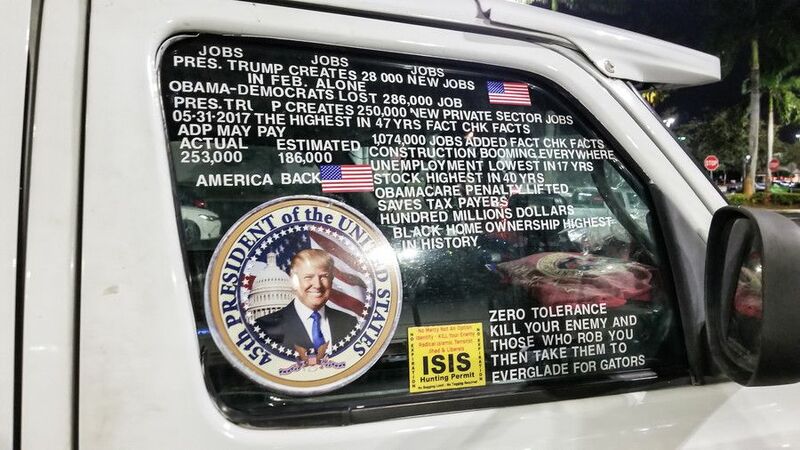 Cesar Sayoc, suspected of mailing at least 15 pipe bombs to prominent Democrats, was just getting started, according to law enforcement sources who say they found a “hit list” of over 100 names in his Trump-spangled van. The list, which includes names and addresses, was found in the van where he is believed to have lived and constructed the devices. Sources familiar with the probe say Sayoc told FBI agents and other authorities that he did not mean to hurt the targets during a brief interview at their South Florida field office. The fifteenth envelope – a third mailing destined for CNN headquarters in Atlanta after two earlier packages were sent to the station’s New York offices – was intercepted Monday afternoon at a postal facility. Sayoc briefly appeared in a Miami courtroom on Monday. He is expected to be moved to New York, where prosecutors will seek to hold him without bail as a flight risk. Sayoc’s defense attorneys belittled the evidence in the FBI’s possession, which amounts to a fingerprint and a “possible DNA association” between two of the devices and a genetic sample from an earlier case. The alleged bomber has quite an extensive criminal history, including charges of theft, possession and sale of steroids, traffic violations, and bomb threats. The latter saw him placed on probation in 2002. He filed for bankruptcy in 2012 after losing his home to foreclosure in 2009. Media have made much of the fact that he’s a registered Republican, though felons cannot vote in Florida. Sayoc’s direct-mail campaign was immediately seized upon as a political football by both Democrats and Republicans as the contentious midterm elections approach. Democrats blame President Trump, who has spoken out against all of the bomb recipients at various times; Republicans blame high-ranking Democrats like Hillary Clinton and Eric Holder, who have also used inflammatory rhetoric in the run-up to Election Day. Others point to the cartoonish appearance of the “bombs” and their failure to explode as indications they were meant as an “October surprise” to sway the election, rather than a genuine threat. While the bombs were treated as live devices, subsequent analysis revealed they were so poorly constructed they could not have gone off. Sayoc was charged with five federal crimes and faces up to 48 years in prison if convicted. Among the recipients of his packages were George Soros, John Brennan, Maxine Waters, Cory Booker, Barack Obama, and Robert DeNiro. If Jeff Zucker can be believed, CNN has received another pipe bomb which, like the previous described pipe bombs, almost certainly isn’t a bomb at all, but a pile of odds and ends made to resemble a pipe bomb (for those who have no idea what a real pipe bomb looks like). Someone opened fire on the Republican Party headquarters in Volusia County, Florida, leaving the building’s windows smashed and the offices riddled with bullet holes. Staff locked up and left the GOP headquarters - which sits in an inconspicuous strip mall unit next to a vape shop and a restaurant in Daytona Beach, just northeast of Orlando - on Sunday afternoon. When they returned on Monday morning, they found the building shot up and the sidewalk littered with broken glass. Cesar Sayoc is an amateur body builder and former stripper, a loner with a long arrest record who showed little interest in politics until Donald Trump came along. On Friday, he was identified by authorities as the Florida man who put pipe bombs in small manila envelopes, affixed six stamps and sent them to some of Trump's most prominent critics. Michael Moore has him in his film. What are the odds?